Why do you drag yourself out of a warm bed on a chilly morning? Why do you sit in glacial rush-hour traffic five days out of seven? Why do you work, sweat, slam down an energy drink before climbing back on the hamster wheel to work some more? For most of us, the reason is simple: we love our kids and we want to provide the best possible life for them. Of course, that means more than just buying an amazing home with in a really nice neighborhood (but if we are honest, that’s important too). Someone once said that life is what happens when you are busy making other plans. And it’s true. One minute your kids are learning to tie their shoes, the next, they are off to attend college. It is all too easy to miss the in-between moments that end up being the most important of all. At The Waters, we understand that life is more than a mad dash between hurried errands and paying bills. It’s about creating something more, something real that you can share with those you love. And that’s what makes us different. The Waters is more than a place to hang your hat. It’s a vibrant planned community where you can really live life, instead of just passing through it like an afterthought. Our thought-out community is built around a lifestyle that puts you at the center of it all. From parks and a stunning marina, to a Town Square with trendy shops and kid friendly playgrounds and parks, you’ll find the life you have always waiting for you right here in Pike Road, Alabama. Between growth spurts, braces, Little League, skinned knees, climbing trees and a blur of school activities, kids grow up, all too fast. Don’t miss out on it. You still have time to create the sweet memories they will look back on. It’s not to late. You can instill lifelong values like community, friendship, sportsmanship and just plain old-fashioned clean, family fun with your kids. Come to The Waters where you can enjoy up-to-the-minute, high value amenities at an old-fashioned pace. Come see why we are different. We invite you to spend time walking our winding fitness trails, enjoy bocce ball courts, miles of shady shoreline fishing, and comfy community rocking chairs where you can sit and enjoy the sunsets over sweet iced tea. It’s About Family: It’s About Home. 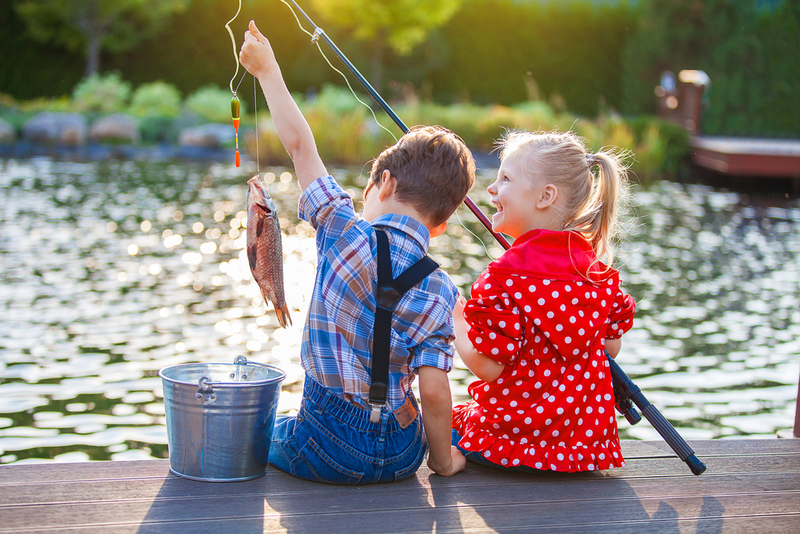 When your child’s face lights up with joy the first time they catch a fish, you’ll know what sets us apart. When you see your granddaughter throwing out the first pitch at the local softball game, you’ll feel it. And when your kids are playing in the sprinklers with their friends, throwing water balloons at each other, or camping in the backyard, telling each other scary stories over s’mores, you will know why a planned community is simply a better place to really live. Because living is what is really is all about. When you are looking for a place to raise your family, or somewhere to retire and enjoy all you’ve worked so hard for, shouldn’t it be a place that is built around you? A place that offers more than just a beautiful house.